The Soviet Winter offensive of 1942 on Zhizdra-Bolkhov area. The Soviet Winter Campaign, like its component Moscow offensives, was an immense and complicated endeavor. While the principal Soviet operations drove the Germans back from the immediate approaches to Moscow, they did not achieve their ultimate aim of destroying German Army Group Center. They did not, in part, because of failures on the flanks, which either produced no operational results and, hence, had no strategic impact, or which dissipated the striking power of the Red Army on the main (Moscow) axis. For these reasons, the ignored flank operations are important. The twin Briansk Front offensives languish in obscurity, just as do the details of other Soviet operations during the waning stages of the Moscow counteroffensive. Mention is made of the operations in separate chapters of memoirs (such as M. I. Kazakov) and unit histories, but the many Soviet encyclopedias on the war ignore the operations, and no other open source detailed accounts exist to substantiate the ample German archival materials attesting to the operations' existence. Given the potential role these operations had in the stretching of German Army Group Center resources in a time of great peril, they deserve more attention than they have received. Soviet war docs (from book "Battle for Moscow" TERRA 15 4(1)). Report Commander Armies of Bryansk Front to the Commander of the Southwest Direction about route of the Orel Grouping of the opponent. I report the reasons on the further development of operation on destruction of the Orel grouping. 1. Spent operation by forces of Bryansk Front on route of the Orel grouping of the opponent and taking Orel was late. The opponent, having created defense though also hasty, on the rivers Oka, Zusha, Neruch, has detained progress forces of 61st and 3rd Armies, and on direction Livny, Maloarhangel'sk on a site of group of general - lieutenant Kostenko and 13rd Army, having thrown reserves ( two regiments of 168th Infantry Division, three battalions of motor-infantry with 15-20 tanks of 3rd Panzer Division, 1st Brigade SS and two regiments of 299 Infantry Division), has passed to more significant counterattacks, than on other sites of front. As a result, group of general - lieutenant Kostenko and forces of 13th Army, having lost temp of offensive, have stopped and in part retreat on boundary Vyzovatovo, Zagorozhenka, Seteneva and further on the river Foshnja. 2. Forces of front appeared stretched on front, not having any more or less compact grouping on one or several directions that does not give positive successes for the further offensive actions on route and destruction Mtsensk-Orel-Maloarhangelsk grouping of the opponent. 3. For route Orel grouping of the opponent as the main and an immediate task of armies of front, alongside with development offensive of 61st Army in general direction Bolkhov, Moshenoye (covering Orel from the north), it is necessary strike simultaneously powerful impact in scope Orel from the south than to reach interaction of armies of front. Direction most adequate to the decision of this operative task, think - impact from area of station Turovka, Milyaevo, Hitrovo in general direction Hotetovo, Bolshaya Bystraya. 4. The further development of operations most probably, as continuation of development offensive by forces of 61st and 3rd Armies to the west, with simultaneous turn of the nain grouping of 13rd Army and mobile formations (three-four Cavalry Divisions, two tank and one motorized brigades) on the southwest for joint actions with 40th Army of Southwest Front on route Kursk grouping of the opponent, having the general direction of efforts - L'gov. 5. Alongside with grouping of 61st Army, for action on a joint of 3rd and 13th Armies it is necessary to concentrate five-six rifle division, four cavalry divisions, two tank brigades and one motorized brigade with construction of the deep fighting formations in three echelons: the first echelon - three-four rifle division; the second echelon - two rifle division; the third echelon, which use means after break German defenses, - in structure of all mobile formations. a) 283rd Rifle Division, 6th Guard Rifle Division, 212nd Rifle Division - 3rd Army and 307th Rifle Division, 143rd or 134th Rifle Division - 13th Army; other 287 Rifle Division from the front reserve, located in Lipetsk. c) 129th, 150th Tank Brigades and 34th Motorized Brigade which demand reinforce first of all by tanks. Instruction of the Commander Armies of Bryansk Front to the Commander of 61st Army on offensive operation with task route Bolhov Grouping of the opponent. 1. The opponent, having created defense on the western bank of Oka river, organized fire with counterattacks reflects offensive forces of 61st Army. 2. On the right - 10th Army by main forces conducts fight, finishing an encirclement and route Suhinichi groupings of the opponent. In southwest of its part stop on boundary Usty, Kolosovo, Belev. Divide line with it - Malevka, Belev, Dyat'kovo, Klimovichi, Stary Byhov. At the left - 3rd Army conducts fight on the river Zusha. To morning 6.1.42 replaces the formations of 61st Army covering direction Mtsensk, Plavsk. Divided line with it - Zhadnoye, Arkhangelsk, Butyrki, Voroshilovo, Vorotyntsevo. 3. To the commander of 61st Army to rearrange the main grouping (342, 350, 346 RD, 91, 52, 55 CD, 142 Separate Brigade, two divisions of "Katusha", 207th Artillery Regiment) on the right flank in area Belev, whence to put the main impact in general direction Zaytsevo-1, Gnezdilovo, bypassing Bolhov from the northwest. Cavalry Corps use on coming flank in the general direction on Ozerno, Shvanovo, Peskovo. Before exit 52th and 55th CD to provide the right flank 91st CD. The immediate task -10.1.42 to seize area Bolhov; further to develop impact on Mosenoye. For maintenance of the actions on east bank. Oka river leave two rifle divisions which internal flanks to put auxiliary impact from front Fedjashevo, Dubrovka, in direction Altuhovo, Mihnevo. 4. A regrouping begin immediately and to finish it to morning 7.1.42. Report of the Commander Armies of Bryansk Front to the Soviet High Command about conditions in strip of front and renewal offensive on Bolhov direction. 1. The opponent continues defend on boundary on the western bank of the Oka, Zusha, Tim rivers, strengthening by reserves in areas Bolhov, Orel, Maloarhangel'sk. Created by him "cutting off" position on the river Vyrka, amplifies a supply of individual reserves. On approaches to Orel on the western bank of the river Optuha defensive works. Before front still there is German 2nd Army in structure 53rd, 35th and the rests 34th Army Corps, and also the rests 29th Motorized Division and motor-parts 17th and 18th Panzer Divisions Guderian's Army. 2. Armies of Bryansk Front, take active defense on a boundary on east bank of the river Oka and the river Zusha up to Zadushnoye, Dichny, Skorodno, Vorovo, Zhenovets and further on the river Tim, on the right wing since morning 7.1 have gone over to the offensive by striking force of 61st Army in general direction on Kas'yanovo. 3. 61st Army by striking forces in structure of three RD and one CD since morning 7.1 take in offensive from a boundary of northern bank of the river Vyrka in direction Kas'yanovo and on 12.00 have reached: 346th Rifle Division conduct fight on Veyno, Retyun', having before coming from the south 1,5 German regiment with artillery; 342nd RD, developing impact of the right flanks, taking fight for Cherelushino, Hamkino; before it act German regiment " Great Germany "; 350th RD - in area Dulino, in the second echelon is 346th RD, in fight was not entered; 97th CD from 7.00 area Rylovo after a night march in readiness to operate on the right flank of a striking force. On other front of army on east bank of the river Oka from Sem'unovo - 387th and 356th RD, take fight by internal flanks on Altuhovo, have seized Teromtsy, Karagashinka, Tolkachevo. In area of fights - snowstorm, a wind up to 9 bals. 4. 3rd Army actively defends on area of the river Zusha up to Zadushnoye, Dichny, Skorodnoye. Reflected German combat intelligens. From seized 6.1.42 villages Studenets and Mihaylov by counterattack of 137th RD the opponent knock out. 5. 13th Army actively defend boundary Nikolayevka, Vorovo, Zhenovets and farther on the south of the river Tim up to New Saviny, reflecting on right flank private attacks of the opponent. 6. 3rd and 13th Armies conduct preparation under instruction N03/from 5.1.42. Fighting structure of all divisions of 3rd and 13th Armies within the limits of 400-800 active soldiers, behind exception of stronger 6th Guard Rifle Division. 1. From 6:00 January, 13 1942 transfere 61st Army of Bryansk Front in submission of the Military Council of the Western Front in structure 342nd, 346th, 350th, 356th and 387th RD, 91st and 83rd CD, 68th Tank Brigade, 142nd Tank Battalion, 207th Artillety Regiment, 239th Auto Battalion. 2. Divided line between the Western and Bryansk Front from 6:00 January, 13 1942 : Ryazhsk, station Malevka, Kuznetsovo (10 kms to the north Mtsensk), L'govo, station Bely Berega, Mglin, station Saltanovka. Report of the military council of Southwest Direction on necessity of strengthening of Bryansk Front. 1.Main effort Germans direct for preservation behind themselves of Bryansk area and a powerful railway and highway with cities of Orel, Kursk, Kharkov. 2. For maintenance of successful offensive of the left wing of the Western Front important probably is faster to seize area Bryansk. Owning unit of roads in this area, Germans have an opportunity impacts from a southwest to prevent promotion to the west of the left wing of the Western front and basing on Bryansk woods to detain offensive to Bryansk from the east and northeast. Most effectively it is possible to develop offensive on Bryansk from area of Orel. Here there passes the strip of district most convenient for approach with well advanced network of roads. The exit of our forces in area of Orel will allow to advance the main forces of Bryansk and Southwest Front to the west more successfully. However the staying in structure of Bryansk Front 3rd and 13th Armies are so weak, that we may not make on any serious offensive by these forces to Orel. Under the report of comrade Cherevichenko both armies together on 200 kms front as of 8.1.42 have: active soldiers 4500, sub-machine guns 117, machine guns 149, mortars 47, divisional guns 82, regiment's guns and 45 mm guns -19. To take Orel and promote Western Front on Bryansk, ask to strengthen Bryansk Front by four rifle divisions, two cavalry divisions and two tank brigades. All these forces, except for one rifle division, will be included in structure of 3rd Army for the organization offensive on Orel and further on Bryansk. One rifle division will be transferred in 13th Army. After reception of such strengthening to be presented the opportunity to remove 6th Guard Rifle Division in your reserve in area Verhov'e for it's reformations in rifle corps. Report of the Commander Armies of Bryansk Front to the main staff of RED ARMY about route of the opponent on the Orel direction. I report reasons on forthcoming actions of Bryansk Front. 1. The opponent by forces 53rd Army Corps, 47th Panzer Corps (with insignificant quantity of tanks), 35th, 34th and 48th Army Corps has passed to rigid defense on the Oka, Zusha, Neruch, Tim rivers, not supposing an exit of Soviet forces on front in area Orel both to the north, and further on Bryansk direction. The opponent aspired to reserve flank position in relation to the left wing of the Western Front and keeping a railway junction Orel and highway Orel - Kursk as a basis of the communications of 2nd Army, not allow expansion of break. 2. Successful development offensive on the left wing of the Western Front to Kirov, Roslavl', at deduction by the opponent of area Orel, Karachev, Kromy and further Bryansk unit, connects development of our offensive actions and creates threat to the left flank to the Western Front, enabling the opponent of maneuver to the north. Before Soviet armies of front the steadiest units of the opponent (motor-infantry) continue to operate and removal of German forces is not marked. 3. Ten-days fights of 61st Army which through Belev has occupied flank position in relation to Oka positions of the opponent, have shown, that opponent, understanding treat of it's left flank, stop on "cuting off" position on the river Vyrka. The striking force of 61st Army (three rifle divisions and one cavalry division) has not achieved success first of all its actions were not connected to simultaneous powerful impact on defense of the opponent on the river Oka. Promotion of 61st Army to the west without liquidation Belev-Bolkhov Group does not eliminate group of the opponent. 4. Therefore I think main task of armies of front - interaction of 61st and 3rd Armies to crush Belev-Bolkhov Group of the opponent with the subsequent impact in the general direction on Karachev and encirclement Orel from the north. 5. For this purpose I believe necessary the main grouping of 61st Army keep in area Sorokino, Veyno with drawing impact around Bolhov from the west, further - on Hvastovitchi, Bryansk. The main group of 3rd Army create on the right flank in area Kuznetsovo, Mtsensk, Chern' and in interaction with 61st Army strike on Zlyn', further - in the general direction on Karachev. 13th Army to put auxiliary impact in direction Maloarhangel'sk, further - on Kromy. 6. For this purpose urgently it is necessary to strengthen the right flank of 3rd Army by forces of three-four rifle divisions, two tank brigades, two artillery refiments, two - three avia divisions and strengthed forces of 3rd and 13th Armies. On a Bryansk direction Germans take counterattack against parts of 10th Army and 20.1 occupies Ludinovo, directing the basic efforts to connection with garrison Suhinichi. It's Bolkhov Group conducts defensive fights. Order of the Commander of Southwest Direction to the Soviet High Command about operation of Bryansk Front on route Mtsensk-Bolkhov Grouping of Germans. 1. The main grouping of 3rd Army after exit on boundary Rybino, Storozhevoye, Konstantinovka the main efforts to direct on destruction in interaction with 61st Army Bolkhov grouping of the opponent. Simultaneously to provide by part of forces these actions from the southwest on Orel direction. In the subsequent from a boundary Uzkoye, Znamenskoye, Zhitkaya, 3rd Army with mobile group (four Cavalry Divisions and two tank brigades) should seize Orel, bypassing it from the northwest and 61st Army - to develop offensive on Karachev, Bryansk. 2. The auxiliary impact planned by forces in structure of two Rifle Division from front Prilepy, Vyazhi in direction Glubni, Haustovo, Azarovo to not make in view of isolation of these actions from a direction of the main impact of 3rd Army. b) The strongest and efficient 6th Guard Rifle Division to remove in area Gladkoye, Zhuravinka, Kamenka in a reserve Commander of front. The operative applicability - to operate or development of success on a mainstream of 3rd Army or take part in auxiliary impact together with 212nd and 269th Rifle Division in direction Budovka, Azarovka, Kamenevo. Before commissioning on one of these directions the division should be ready to reflection of probable counterattacks of the opponent on Novosil' direction. d) To allocate updating and arms to 8th Cavalry Corps of Bryansk Front having in this time shortage; 8019 rifles, 1358 swords, 1999 revolvers, 968 submachine guns, 110 antitank rifles, 26 45mm guns, 29 67-mm guns, 118 50mm mortars, 46 82mm mortars, 3000 grew grey. The first Soviet attempts to take the Mtsensk city have shown, that the opponent has here the powerful prepared defense, therefore command of 3rd Army has decided to try to make the way to the north of city. The commander of 137th Rifle Division the colonel Grishina was thrown in area of village Kuznetsovo-1, these are seven - eight kilometers to the north of Mtsensk. In case of success on this site Soviet forces should attack the Bolkhov, that considerably would help the divisions of 61st Army attacked Bryansk from Karachev. Before offensive 137th RD has received two mid-flight battalions of updating, on four hundred person, but there was it badly trained. It was not time for detailed studying of German defense and colonel Grishin has decided to lead by one battalion of 771st RR developing attact. On dawn January 23, battalion of the senior-lieutenant Nasteko has gone to fight. Communication with it has interrupted in the first half an hour of fight. Only after five hours fight a rests of a battalion, no more than hundred persons have returned. Order of the Commander Armies of Bryansk Front to the Commander of 3rd Army about preparation of offensive operation with the purpose of route Bolkhov Group of the opponent in interaction with 61st Army of the Western Front. 1. The opponent at the front remains in a former grouping. 2. In the performance of my plan from 21.1.42 main grouping strike from front the Zavodskoy Hutor, Butyrki in direction Babinkovo-1, Karandakovo-2, Bolotovo. Task - for the third day of operation by the main forces seize boundary Rybino, Storozhevoye, Konstantinovka. After taking the western bank of the river Oka on site Bolshoye Dezhkino, Kukarenkovo to provide input in break of mobile group. In the subsequent, being covered by part of forces from a southwest from Orel, in interaction with 61st Army the basic efforts to direct on route Bolkhov Group of the opponent. 3. For maintenance of actions by the main grouping two RD (212nd and 269th) occupy defense at the line Butyrki, Prilepy, Dichny with more dense internal flanks of these divisions for the subsequent offensive in direction Budovka, Azarovo, Kamenevo. 4. 6th Guard Rifle Division to 29.1.42 remove in my reserve in area Gladkoya, Zhuravinka, Kamenka. The operative applicability of a division - to operate on development of success on a mainstream of 3rd Army or come together with 212nd and 269th Rifle Division in direction Budovka, Azarovo, Kamenevo. Before move in action on one of these directions be ready to reflection of possible counterattacks of the opponent on Novosil'. 5. 57th Rifle Brigade NKVD to 28.1.42 place under the authority the commander of 13th Army. Divided line with 13th Army on 28.1.42 - Ledyazhka, Pogorelovka, Pavlovo, Bilshaya Bystraya. 6. Give this plan code name "Karandakovo". Started of operation - by my special instruction. 30.1.42 Soviet formations of 16th Army again occupied city of Suhinichi and the opponent from this direction began a withdrawal to the southwest. ... 7. 16th Army since morning continue offensive to all front. The opponent shows persistent resistance. To outcome of day in the centre of army move on front Chvanovo, Zhivodovka. The instruction of a military council of the Western front to military councils of 16th and 61st Armies about tasks in route suhinichi-zhizdra and bolkhov groupings of the opponent. 1. The nearest purpose bolhov-suhinitchi-bryansk groupings of the opponent for the nearest period is not break of Soviet forces to Bryansk and Orel. Carrying out this main task, the opponent at any cost will aspire to keep defense positions and, probably, will aspire to liquidate by active individual operations the formed bag that line the stretched front then, having received economy of forces, by consecutive operations may try to leave on railway Belev-Suhinichi. For deeper operation now the opponent does not have not enough forces. 2. Tasks of 16th and 61st Armies - former, namely: 16th Army - route suhinichi-zhizdra groupings and take Bryansk, 61st armies - route bolhov groupings and impact to Bryansk. 3. The quantity of formations in armies is quite enough for performance of this task, but the fighting structure of connections requires some updating. For updating divisions (in the period up to 15.2.42) go: in 16th army - 9000 soldiers, in 61st army - 7000 soldiers. 5. Term of general offensive not later than 15.2.42. 6. To the commander of 16th army 11th Guard Division to remove in a reserve of front, in area Suhinichi. 11th Guard Division it will be completed up to full state and it is unwrapped in special formation (Guard Rifle Corps) for 16th army. ... 7. 10th Army since morning have gone over to the offensive. By 13.00 right-flank formations has seizedMalinovski, Mar'ino, Zamosh'ye, Gorelovski and conducts fight on approaches to Yakovlevka. On this site of front the opponent (German) shows weak resistance. In the centre conducted persistent fights for Bel'nya, Krukovo. 8. 16th Army. Position of formationss of army without essential changes. Within day in the centre and on the left flank of front there were intense fights. The opponent unsuccessfully conducted offensive in directions Budskiye Vyselki, Klintsy (no Klinzy) by two battalions of skiers and in direction Dodurovo up to infantry regiment. 9. 61st Army on right flank conducted fights with coming opponent. Vesniny village are taken back by our forces. At the front Shvanovo, Leninskoye under impact of the opponent our formations have left Shvanovo, Klyaginski. Fight proceeds. In February forces of 16th Army have replenished, due to released prisoners of war under Kozelsk city. The front has sent on strengthening of forces - 97 Rifle Division and two tank brigades. At the end of February offensive to a large strong point of opponent Popkovo began. The main impact rendered 146th Tank Brigade, the next divisions blocked the opponent who has become stronger in the nearest villages. Offensive was well prepared. All movement of forces were made at night with a view of masking. Fight began from artillery preparation. On the passes made on night in deep snow, tanks with a landing were set, they were followed with the infantry accompanied with artillery fire. In second half of day Popkovo was taken. The army started preparation for take Maklaki and Bryn' village, having for an object to reject Germans behind Zhizdra river. Order of Soviet High Command of Western direction about offensive operation with task rout rzhev-vyazma, zhizdra-bryansk and bolhov groups of enemy. ...2. Rout zhizdra-bryansk and bolhov groups of enemy: zhizdra-bryansk group and taken Bryansk city by forces of 16th Army, strength by 5th Guard Rifle Corps (11 Guard RD, 4,30,115,123 RBr), 97th and 116 Rifle Division, move and take line Yadrovo-Vysokoye-Krasnoye-Sosnovka; Bolhov group-by forces of 61st Army, strength by 149th RD, with 3th Army formations. Order of the Commander Armies of the Western Front to the Commanders of 10th, 16th And 61st Armies about preparation of offensive operation with purpose of route Bryansk grouping of the opponent in interraction with armies of Bryansk Front. 1. The Soviet High Command to armies of the Western Front puts task to March 5, rout Bolkhov-Zhizdra-Bryansk grouping of the opponent and occupy Bryansk and to be fixed on our old defensive boundary on the Desna river from Yelnya up to Yadrov and further on a line on Vysokoye, Krasnoye, Sosnovka. 2. On the right wing - 43rd, 49th and 50th armies destroy " yuhnov ' group of the opponent, and further vyazma group. At the left - the striking force of 3rd Army of Bryansk Front develops offensive in a direction of Bolhov city. a) 10th Army. Take in offensive 25.2.1942. The immediate task - to destroy resisting opponent and to outcome 1.3.42 going on a boundary Chiplyaevo station, Verkulichi, Ustrozhino, Podpisnaya station, Usohi. Further to come in the general direction on Roslavl ' with task to came and be fixed on the Desna river. Special attention on maintenance of a joint with 16th Army. b) 16th Army. Strengthened by 5th Guard Rifle Corps and 97th RD take in offensive 25.2. The main impact to put on the right flank. The immediate task - to outcome 1.3.42 rout zhizdra group of the opponent and to leave on a boundary: Usohi, Sukreml ', Zhizdra, Zikeevo, Moylovo. Further offensive in direction Dyat'kovo, Sel'tso, encirclemented Bryansk from northwest. For capture of a boundary on the Desna river, on site, Zhukovo, Yadrov, to put forward strong advance formations. Left boundary line with 61st Army: Krapivna, Odoyevo, Kireevskaya station, Ul'yanovo, Podbuzh'ye. c) 61st Army. Strengthened by 149th RD take in offensive 25.2.42. The main impact put on the right flank. The immediate task - in close interaction with a striking force of Bryansk Front to 2.3.42 route bolhov grouping of the opponent and to leave on boundary Ktsun ', Klen, Uzkoye. Further come in a direction to Bryansk. The Air Forces. 1) To destroy the opponent in areas Ljudinovo, Dyat'kovo, Zhizdra and Klen, Krasnikovo, Bolhov, Anina. 2) Not admit the approach of the opponent in area Bryansk. 3) To cover shock groupings of 16th, 61st Armies. 4. On reception and given orders to inform. The report to the Chief of staff of Bryansk Front about the decision to continue offensive on Bolkhov direction. Report to Timoshenko about following decision of general - colonel Cherevichenko on destruction of the opponent in area Hmelevaya, Fatnevo, Krivtsovo, Fetishevo. 1. The main group of 3rd Army in structure of 60th, 137th, 287th Rifle Division, 79, 80th Tank Brigades make a former task. 2. 283rd Rifle Division, strengthened by three ski battalions, in night on 2.3.42 strikes a blow in a direction around Hmelevaya from the northwest; further attacks Fatnevo, seizes area of artillery positions of the opponent and together with other units of army destroys the opponent in point of resistance Krivtsovo, Ushevo. 3. The ski group of 8th Cavalry Corps in structure of four battalions at the same time breaks to direction of height 176,8, Bagrinovo, destroys the opponent in Bagrinovo and further strikes a blow on Vvedenski, Dubrovski, cut off a way of withdrawal of the opponent. 4. 8th Cavalry Corps focused in area Maly Golubochki, Hlopovo, Prilepy in readiness to develop success of 283rd Rifle Division. 356th Rifle Division providing impact of 283 Rifle Division and ski battalions, strikes a blow in direction Palchikovo with task to seize boundary Palchikovo, Homyakovo. ... 8. This decision (Cherevichenko) is not cancellation and revision of the basic plan of operation and has task to speed up route of the opponent, bypassing from the northwest the main points of resistance of opponent Krivtsovo, Ushevo. To disband 52nd Cavalry Division of 8th Cavalry Corps and to turn it on updating 21st and 55th Cavalry Divisions of the same corps. Into structure of 8th Cavalry Corps enter 112th Bashkir Cavalry Division. 9. 16th Army. After artillery bombardment at 8:00 has gone over to the offensive on all front. Developing offensive, units of the right and left flank on separate directions have promoted up to 3 - 5 kms. The settlement Skachek is occupied. Offensive proceeds. The opponent shows persistent resistance, on separate sites passes in counterattacks by infantry and tanks. 10. 61st Army. By right flank at 7:00 has passed in offensive. On other front kept an occupied boundary. Coming units met persistent resistance of the opponent passing in counterattacks, and within day of progress have not achieved. Offensive proceeds. Directiva of the commander armies of Bryansk front to the commander of 3rd Army about preparation of offensive operation on route Bolkhov grouping of the opponent. d) The main forces from boundary Kobyleno, Nasedkino strike on Bolkhov from the southeast with a task together with units of 61st Army surround and destroy Bolkhov grouping of the opponent. 6. From boundary Pertsovski, Kazminka enter into break mobile group in structure of 8th Cavalry Corps with 79th Tank Brigade with task: operating ahead of shock group come in direction Dubrovski, Milyatino, Pokrovskoye, Nasedkino, Malaya Kut'ma and to outcome of 2nd day of operation seize boundary Kreshenski, Lunevka, Nasedkino; not supposing the approach of German reserves, promote a striking force of army on destruction Bolkhov groupings of the opponent. 7. On other front of 3rd Army, strongly keep boundaries of defense to prepare offensive of the strengthened groups in directions: a) 240th Rifle Division - Glinskoye, Frolovka, Krasnaya; b) 269th Rifle Division - Leski. 8. For immediate fastening results of tank's attack prepare three best separate rife companies as a landing-descend on sledges behind tanks. For strengthening of effect of tank attack to prepare one flame-thrower battalion harrows behind tanks. 10. 16th Army. As a result of day persistent fight the opponent beat out from strong point Kazar' are occupied the north and west surburbs of Bryn ', in a strong point Maklaki our forces have penetrated into depth of settlement, finishing route German garrison. In the centre of front our forces came to strong point Zhivodovka, make fight at its surburbs. In Kazar' are seized big trophies which are counted. Offensive is complicated begun with second half of day snowstorm. 11. 61th Army. At the front armies offensive in directions Lubovka, Vesniny, Yelovski, Dubenka was conducted. Formations had no essential progress. During day beat out a number of counterattacks of the opponent. There is a slow progress in direction Dubenka. 2. Retreat forces of 283rd, 60th, 137th, 6thGuard. Divisions and 80th Tank Brigade from Hmelevaya, Krivtsovo, Fetishevo during 18-21.03.42. Order of the Commander Armies of the Western Front to the Commander of 61st Army with plan realization of offensive operation on route Bolhov grouping of the opponent. 1. The first stage of operation - to destroy the opponent in area Kirejkovo, Zaytsevo with exit and fastening on boundary Kireykovo, Zaytsevo, Kurnosovka not later than 2.4. For performance of task of the first stage of operation to create a group of forces in area Gos'kova, Veyno in structure not less than three rifle divisions, the tank brigade, two artillery regiments and two battalions "Katusha." The main impact to put in direction Gryn ', Peredel ', Annina. Auxiliary impact from area Storonka, it Is equal - in direction Kas'yanova. Start offensive 27.3. On right flank of army pass to defense up to one division on a boundary Dudorovskiy, Vesniny, high 237.1, Turchenovka, high165.0, Klyaginskiy, Ukolitsy. 2. The second stage of operation - to destroy Bolhov grouping of the opponent, seize Bolhov with exit and fastening on a boundary Reseta river, Yelensk, Peshki, Borilovo, Shashkino. For decision of problem of the second stage of operation create on right flank of 61st Army in structure up to four divisions, tank brigade, two artillery regiments and two battalions "Katusha." The main impact put in direction Krapivna, Shvanova. Around Bolhov from the southwest. 328th Rifle Division take Zhivodovka. Seized: 3 guns, 120 rifles, 7 machine-guns. Kill 125 German soldiers. 1. 61st Army, not having sufficient forces on April 8-11, have not achieved success in offensive. The become limp roads exclude an opportunity of maneuver of formations and delivery an ammunition. The aircraft is deprived opportunities to work from air stations. 2. I think temporarily to suspend offensive actions of 61st Army. Formations of 61st Army be fixed on a boundary with a first line of defense: Vesniny, Krapivna, Kosovka, Pesochenka, Ozerenski, Peredel ', Mitrohin, Romanovka, Stokanov, Bobrik river, Obloginyh, Dol'tsy, Mihaylovski. 3. The specified boundary of defense occupy with five Rifle Division (387th, 346th, 350th, 342nd and 356th). To remove in the second echelon: 149 Rifle Division in area Dubna, Brezhnevo, Sloboda; 60th Rifle Division in area Kuznetsovo, Bakino, Sobakino. 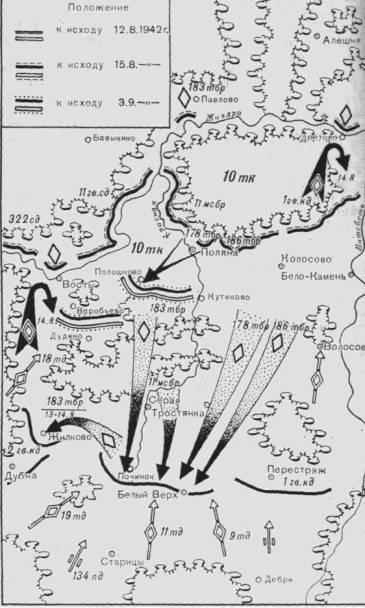 Plan action of forces of Bryansk Front on April 1942. 1. By all forces of 61st Army and forces of 3rd army (60, 283 Rifle Division) to continue offensive operation on destruction Belev-Bolkhov groupings of the opponent. Formations of 3rd, 13th, 40th Armies continue strengthen boundaries of defense. Order of Soviet High Command to the Commander of Bryansk Front about preparations offensive operation on Kursk-L'gov direction. 1. 40 army in structure of seven Rifle Division, three Rifle Brigade, two Tank Brigade develop at the front Rozhdestvenskoye, Rzhava. The main impact by forces of six Rifle Division, three Rifle Brigade, two Tank Brigade and 4 Tank Corps to put in direction Sarayevka, Cheremoshnoye, Kitayevka and further around of Kursk from the southwest with task to seize Kursk and to cut rail-road and highway Kursk - L'gov. 4th Tank Corps with the beginning of operation to have in the second echelon and after break of front to throw out it on the left flank of a striking force on L'gov. 3. 61st, 3rd and 13th Armies simultaneously with offensive of flank of front to undertake offensive and came on boundary Bolkhov, Otrada, Voroshilovo, Kolpna. 1st Tank Corps move in area Gorbachevo. 3rd Tank Corps move in area to the east from Livny and put it in the nearest rear that in case of need they might support infantry.
" In middle of January under the decision of the Soviet High Command on different sites of German front new offensive was accepted. Armies of the Western front too continued offensive actions. And we participated in them, but already not on the right, and on the left wing of front. 10th army which general F.I.Golikov, odered about experienced heavy days. Germans not only have stopped it, but, having thrown forces on Zhizdra direction, have seized Suhinichi - a large railway station. Delivery roads to Soviet 10th Army of the left wing of the front which has been put forward far forward, in area of Kirov, were cut off. Management and staff of 16th Army have received the order to proceed in area Suhinichej, to accept in submission connections working there and to restore position. Having transferred the site and armies to neighbours, we were set by a marching order to a new place. M.S.Malinin has led our staff column to Kaluga, and we from A.A.Lobachevym have come on command point of front. Here we were accepted by the chief of a staff V.D.Sokolovsky, and then and the commander. Zhukov has acquainted with conditions which has been usual on the left wing. He has warned what to expect to us for additional forces, that we shall accept on a place, it is not necessary. - I hope, - the commander has told, - that you and these forces will manage to be quit the opponent and soon will inform me on clearing Suhinichi city. From F.I.Golikova of 16th army, four rifle divisions (322, 323, 324 and 328) and one tank brigade together with a site of front in the extent of 60 kilometers were transferred. From our old connections with which we were in fights near Moscow, have received only 11 Guards Division ".
" The put by front did not correspond to forces and the means available in our disposal. But it was often then the phenomenon, we have got used to it and have begun to prepare for operation... "
Suhinichi situation. In city was German infantry division which has again arrived from France under command of the German general Gil's has become stronger, and it not afraid Soviet four divisions, which Zhukov has handed to Rokosovski. You see these divisions participated in offensive of winter 1941, have passed with fights more than 300 kms and their Germans have driven back and have beaten out from Suhinichi. In these divisions almost there were no people. Germans sat in warm houses, dugouts and fire points at them were in warm cellars - of that him was to be afraid Russian, coming on the naked chilled fields, Russian which they have just crushed? And Rokosovski makes the following. He "buys" Germans on their technical superiority over us. Germans you see had powerful radio communication and, including, in each division - company of radioprospecting. Rokosovski has ordered, that moving to front collomn his staff carried on open negotiations as if to Suhinichi the staff of 16th Army, and all 16th army, all its divisions will be relocated. On pre-war norms in armies RKKA it was necessary to have 12-15 divisions. For one German division of force nevertheless incommensurable. And when gunners of Rokossovski began to adjust fire on the purposes in Suhinichi, and his pity armies began to designate the presence on initial positions, Germans have not sustained also have broken from city, not waiting storm at night. That Germans have not come and again have not taken Suhinichi, and they subsequently continuously did such attempts, Rokosovski has immediately moved there the staff.
" Everywhere traces of hasty flight. Streets and court yard are cluttered up, a lot of the engineering thrown by Germans and different property. In a court yard where general Gil's was placed, there was a fine automobile motor vehicle. In full serviceability, and any " surprises ". In general in city we anywhere have not found mines. Hardly it was possible to believe, that hitlerites have regretted city. They simply ran carelessly, rescueing the skin. ". ... d) Offensive 2nd Panzer Army in Kozel'sk, Suhinichi direction if in order there will be enough of forces, should have the following purpose: narrowed Soviet wedge in defense, having pressed its southern flank and to create preconditions for the further encirclement to the east of road Suhinichi - Uhnov. Clearing encirclemented in Suhinichi German forces is the debt of honour for 2nd Panzer Army. ... In area 2 Pan. Army the opponent came in depth of the western flank of 53rd Army Corps on road Klin - Kamenka and in a valley of the river Vytebet', continuing yesterday's movement of the parts on a southeast and the south. To the east Suhinichi our attacks have met strong resistance of the opponent. The opponent unsuccessfully attacked the left flank of 24-th Army Corps in area Maklaki, Zimnitsy and Slobodka. 211 Infantry Division. The parts which have arrived now are focused in area Shigry, Polydovo, Sineevo. Other part of a division still moves by rail in Sudimir. Group Krisher. The opponent number on one battalion attacked point in 2 kms southeast Retyun', and also Ivanovka. Russian tighten reinforcements in area of 6 kms southwest Belev and at Ukolitsa. 24th Panzer Corps: parts of a division participate in fight at point Bortnevo. Group of Gil's. Our attack on Voronety has failed cause strong resistance of the opponent. Our losses are significant. The artillery of the opponent with unusual bitterness fires with southeast direction at southern part of Suhinichi. 18th Panzer Division. The attacks of the opponent maintained by tanks, on Mihalevitchi are reflected. Point Nikolayaevka after time capture by opponent is again occupied by our armies. After street fights our armies have left Kuklino. Group Ljuttvits. Attacks on Slobodka were fail. 339th Infaltry Division. Parts of a division are in a way from Dyat'kovo on Ludinovo. 17th Panzer Division offensive in Kamenka direction. 2nd Panzer Army allocate forces for future first of all to hold down large forces of the opponent before Suhinichi. For this purpose it is necessary to keep under any circumstances a line of defense Bryn', Popkovo, Kazar' and to provide its rear communications. On any withdrawal from this line the sanction of a staff of group of armies is required. If Russian will remove a part of forces or will not show activity, it is necessary to renew offensive on Suhinichi. It is necessary to aspire to expanding basis of approch before Suhinichi. The plan - attack from the south, east, west, to cut off the opponent who has broken in area to the west of Bolhov, - should be subordinated to the requirement " to hold down large forces of the opponent before Suhinichi ". 35th Army Corps. On a site 29th Motorized Division attack of the opponent along rail-line was fail. 53rd Army Corps. In area 167th and 296th Infantry Divisions insignificant artillery fire. Before front 56th Infantry Division the opponent from 5:00 attacks Seredechi. 47th Panzer Corps. Before group's of Eberbah during yesterday's fights for Hot'kovo the opponent has lost over 90 soldiers killed. A staff and Company of 317th IR of 211st ID has arrived to Bryansk. On a site 208th ID new attack of the opponent on Kazar' is reflected by artillery fire. 35th AC: On a right site 262 ID has beaten off a number of attacks of the opponent force up to Company. 293 ID has beaten off offensive of the opponent on Ryazhsk by forces of two Battalions maintained by artillery. 29th Motorized Division suppressed artillery movement and positions of the opponent in area of 6 kms to the west of Lopashino and supported defensive fights 25th Motorized Division. On a site 25th MD the opponent surpassing fresh forces, stranghted by tanks and aircraft, attacked Kuznetsovo and settlement of 4 kms northwest. Soviet offensive has stopped near a first line. The opponent number up to 2500 soldierss on the offensive from area southeast Troitskoye. It is necessary to be considered with an opportunity of continuation of offensive with the beginning of darkness and break of a line of defense, taking into account number of the opponent up to two divisions and our weak forces. Investigation of the opponent has promoted in a direction of an arch of the river Zusha, 10 kms to the east of Karandakovo. Group Oven has beaten off attack of the opponent on settlement of 2 kms to the south Sereditchi. Our forces have occupied settlement of 2 kms northeast of Yasen'. 47th Panzer Corps: 17th Panzer Division unsuccessfully attacked occupied with superior forces of the opponent settlement Yasen'. Our losses are significant. 3 kms northwest Krasnikovo we occupy settlement. It is seized 10 machine guns and 10 mortars. Settlements of 4 kms to the north and 4 kms northwest Krasnikovo, occupied by the strong opponent having artillery and tanks, might not be again occupied by our armies. The rests of 134th ID conduct local fight for Klen. Group Eberbah after hardly fight has occupied Hot'kovo. The opponent force up to two Battalions has departed to the north. 24th Panzer Corps: 2/3 208th ID has beaten off attack of the opponent by force up Company on Kazar'. 1. 35th Army Corps. On a site of 262 divisions fail impact of the opponent on Verhniy Zalegosh'. On a site of 293 divisions with heavy losses for us and for the opponent fail impact by force up to Regiment. In area to the west Zhilino the concentration of the opponent on an initial boundary that assumes renewal of attacks was observed. 53rd Army Corps: Till now it was not possible to restore our first line of defense on a site of break in area Krivtsovo. Attack 17th Panzer Division on strong defense point in 4 kms southeast of Krivtsovo success had no, because of strong defense of the opponent. Beat of some counterattacks from settlement strictly to the north 5 kms northwest Gorodishe. Our artillery has successfully suppressed a congestion of the opponent and tanks to the north of height of 2 kms to the east Krivtsovo. One tank of the opponent kill. On a site of group Oven our offensive to point 4 of km nothwest Melehovo, had no success. 24th Panzer Corps: on a site 2/3 208 ID beat of impact of the opponent along railroad line Suhinicni-Zhivodovka. Bilaterial artillery firing. On a site 1/3 339 ID are again seized and positions along a marge of a wood to the south of settlement, 19 kms northwest Lyudinovo are held us. Repel impact of the opponent from area Kirov along road Kirov- Lyudinovo. The opponent prolong manufacture trench works on turn of the railway of 17 kms to the north Lyudinovo. Losses of group Oven in time from 9.2 till 19.2 wounded, killed and ill: 85 officers, 1095 soldier. During attack to Kirov - 57 killed, 207 wounded, 256 frost-bitten. The order of the commander group of armies " centres " on conducting operations after end of winter. ... a) 2nd Panzer Army keeps east front and the present positions southwest Suhinichi. On the left flank the army, whenever possible large forces, March, 10 should act from area Maklaki, Kosmatovo in a northeast direction take favorable for the period of an impassability of roads a position adjoining to southern flank of 4th Army in area Volaya. Irrespective of forthcoming operation in the near future follows in interaction with a southern wing 4th Army specially use a grouping to seize central railway point Kirov. Reserve position on a ledge to the north of Bolhov should be constructed so that since March, 1 it would be possible to make removal of a ledge under the order of a staff of group of armies. The further progress to the north of the left wing 53rd Army Corps and left wing of 47th Panzer Corps through a line on both sides Krapivna is cancelled. a) 2nd Panzer Army focuss whenever possible large forces to the left wing with the purpose restore position near Kirov and, having promoted to northeast to take a position, favorable for the period of an impassability of roads, being closed with southern flank of 4th Army. The plan of capture and the subsequent destruction of the railway bridge in Belev remains in force. 2nd Panzer Army: 35rd Army Corps: 262nd ID beat of impact of the opponent on Orlovka. 53rd Army Corps: 25th Infantry (Motorized) Division, in area Krivtsovo and to the north, the opponent has undertaken attack by two groups up to 1000 persons at support of 8 tanks. Attacks are reflected. Opponent who has temporarily put in our defense is rejected. The opponent has lost 3 tanks. Three tanks lost mobility. Losses of the opponent make 400 killed and 72 captured. Our losses: 14 killed and 69 wounded. Damages are put 4 our tanks. On southern flank 112nd ID and 167th ID, in area Semenovskaja, beat of weak attacks of the opponent. 47th Panzer Corps: On a site infantry a shelf " Great Germany " and 134 ID is conducted disturbing fire. Investigation of the opponent briskly operated. The wood of 2 kms southwest Vesniny is cleared of the opponent. 24th Panzer Corps: on a site 2/3 208th ID the opponent has undertaken the attacks maintained by tanks in a direction of boundary Kazar', Zhivodovka. 5 tanks it is destroyed, 2 tanks kill. On a site 18th Panzer Division the opponent conducts repeated attacks at support of tanks, in a direction of our wood positions to the west Popkovo. As a result of heavy fights beat off attacks on Kuklinovo. Simultaneously the opponent has undertaken attack and a direction of area of 4 kms to the east Maklaki and line of strong attacks at participation of infantry and tanks in this direction. Kill Soviet 2 tanks. In total in a strip 24th Panzer Corps kill 9 Soviet tanks. On a site 1/3 339 ID as a result of our attack cut off road M.Shel'to's-Pokrovskoe. It is necessary to expect continuation by the opponent of strong attacks in a direction 208th ID and 18th Panzer Division. 35th Army Corps: 29th MD has beaten off 2 impacts of the opponent in area Jadrino northeast Mtsensk. 47th Panzer Corps. On a site of 134 ID in fights in a blizzard repel strong attacks of the opponent (force up two Regiments), maintained by tanks from the east and northeast direction on Vesniny. 2 tanks of the opponent are removed from fight. The Commander of rear's Corps informs, that the group the guerrilla by force up to 60 persons in area of 7 kms north Zheltovod'ye is revealed. On a site 2/3 208 ID as a result of strong attacks of the opponent maintained by heavy tanks, our parts have left Bortnevo. The marked movement of the opponent from the east in direction Frolovskoye specify intentions of the opponent to undertake offensive operations in direction Usty and area of 1 km to the south Bortnevo. Proceed heavy fights in area Zhivodovka. While all attacks of the opponent are reflected with the big losses for it. On a site of 18th Panzer Division beat off attacks of the opponent to the west Popkovo, in area Kuklino and Maklaki. In area Maklaki there is a strong artillery firing. On a site 1/3 339th ID beat off attacks of the opponent on a strong point of 5 kms southwest Petrovskoye. To the left flank of 293rd Infantry Division movement of the opponent up to 500 persons from Verhnee Alas'yevo in the southern direction are marked. 47th Panzer Corps: on a site of 134th Infantry Division during night and first half of day brisk activity of artillery of the opponent and action of scouts on site Vesniny were marked. At 13:30 the artillery 56th, 134th Divisions and SS "Raih" Division has made joint fire strike on the revealed movement of the opponent in Krapivna. 24th Panzer Corps: on a site 2/3 208 Infantry Division our artillery suppressed movement of the opponent in area Kazar '. Movement of five tanks of the opponent in the northeast direction was marked. On a site 18th Panzer Division after fierce fight our parts have rejected the opponent from a wood to the east Kuklino in the northern direction. Repel impacts of the opponent on Maklaki. In area of corp's rear repel attacks the guerrilla on settlement and railway station Sinezerka. Guerrillas in many places have blown up the railway on line Bryansk - Roslavel' and Zhukovka-Kletny. On a site 25Motorized Division the opponent in time with 16-19.03.42 has lost: 215 killed, 115 - captured. On a site of group Oven repel attack of the opponent by force up to 250 soldiers in a direction of our strong point of 4 kms to the southwest Nagaya. 47th Panzer Corps: on a site of 134th Infantry Division from 11:00 the opponent at support of five tanks attacks Vesniny and settlement of 2 kms to the west. Tanks of the opponent have penetrated into western part of Vesniny. 4 tanks are destroyed. 24th Panzer Corps: in a strip of corps disturbing fire and activity of scouts is marked. The guerrilla up to 400 persons has occupied 19.3 group force Sinezerka. The plan of a withdrawal forces from Bolkhov ledge and preparation of offensive 2nd Panzer Army and 4th Army in Kirov area. 1. The plan of a withdrawal from Bolkhov ledge 23.3. With evacuation of engineering and rear units. A withdrawal from a forward line not earlier than 26.3. Rear-guard are kept as it is possible longer. An intermediate position: 1,5 kms to the north Ignatyevo, Sloboda, Lubich, Stary Vyselki. The intermediate position should be kept three days. In total evacuation should occupy approximately 10 days. Simultaneously with evacuation Bolkhov ledge local attack with the purpose take area Oka river east of Krivtsovo again is planned to seize. Preliminary term 25-26.3. Parts 167th ID (three battalions) remain on new positions since before it is necessary to liberate a battalion of 3rd Panzer Division. 2. The beginning of a withdrawal from a ledge to the southwest from Suhinichi 28.3. 4th Panzer Army, heights on both sides of Hlebosolov - by forces 331st ID (two battalions) and units of group Shlemma. b) begine offensive April 2. 2nd Panzer Army attack by forces of four battalions of 18th Panzer Division from Gusevka to Kosmachevo-Gavrilovka. 17th Panzer Division attack from line from Nosovka to Verzebnevo-Solomonovka-Gavrilovka. 4th Pz Army offensive by forces 19 Pz Division (four battalions) in first echelon, 10 Mot Division (tree battalions). Task of offensive: take Buda and area on the bank of Neruch river by tween sides of Prudki. Then offensive with task connect by forces of 19th Pz Division with north wing of 2nd Pz Army near railroad line west of Konovka with attack by 10th Mot. Division on Kirov fron south-west. In May 1942 Bryansk Front (3rd, 13th, 48th, 40th and 61st Armies) have received big on that time tank forces. To the north of Kastornoye was 16th Tank Corps of the general - major of tank armies of M.I.Pavelkin and in area Kastornoe were - 115th and 116th Tank Brigades. These connections made a reserve of the Commander Front. Seven tank brigades (170th, 14th, 129th, 80th, 150th, 79th, 202nd) were including in Bryansk Front for help rifle forces. Thus, Bryansk Front had about 700 tanks. Besides in a strip of defense of front there was a reserve of the Rate: 5th Tank Army (2nd and 11th Tank Corps, 19th Tank Brigade) and 17th tank Corps - all about 600 tanks. Certainly, all these huge forces prepared by Soviet High Command for offensive. In May it was planned to crush a large German grouping in area of Orel. However to realize this plan it was not possible. In the middle of May the opponent has surrounded Soviet armies near Kharkov, the strategic initiative again temporarily has passed to the enemy. May 22, 1942, K.K.Rokossovsky has returned to 16th Army. To this time army has rejected the opponent behind Zhizdra river, fights temporarily have stopped. Under the Order of Bryansk Front, 16th Army together with 61st Army have begun preparation of new offensive operation. On strengthening of army the tank corps has arrived, from three divisions of the right flank the rifle corps has created. At the end of May operation began. Small number of infantry has compelled to build the fighting formations of divisions in one echelon at a small reserve. In the second echelon the tank corps was allocated, it task was development of break in depth. Rifle divisions have received approximately till 12-15 tanks on direct support. On a mainstream of impact was concentrated from 30 - 40 guns on kilometer of front. Offensive began after 30-minute artillery bombardment. The infantry at support of tanks has managed to overcome the first line of defense of Germans and has put in the second. Time has come to enter the tank corps into fight. But it did not appear in area of concentrations. During planning promotion of the tank corps investigation of district was badly made. Tank corps has got stuck in small river with boggy peat banks. In those two hours, which were required to extend Tank corps to a place of input in fight, Germans on right flank have tightened forces from a site before 10th Army. In centre line came Germans Motorized Division from Bryansk. Despite of it the Soviet infantry continued to go forward and has promoted in depth up to 10 kms. The Soviet Tank corps has begun expansion in the fighting order. Being afraid break of the defense and trying to win time for regruping forces, Germans have thrown bombers. Defensive fights went some days. Germans did not manage to return the left positions, however and Soviet forces as a whole have not executed the offensive task. While operations by the Briansk Front require greater explanation in open accounts, Western Front operations remain utterly obscure except for occasional mention in some German unit histories and extensive German archival coverage. The various offensives, obviously designed to distract German attention and strength from the Stalingrad axis, involved sizable forces, especially the August offensive which was the first offensive operation by newly created 3d Tank Army. In June of 1942 forces of 16th Army once again tried to attack on the Bryansk direction. Under the Order of Bryansk Front more forces were involved, but fights all the same had local character. 10th Army and 61st Army in offensive did not participate and only should hold down active actions of the opponent. The artillery density appeared smaller, than in May fights as the front of offensive became wider. Tanks was present less. Offensive should support great strengths of aircraft. After short artillery bombardment and impact of bombers on the purposes in depth and to advanced positions of infantry of the opponent infantry units and tanks forward were set. Having broken through the first German line defense, Soviet forces have stop. The opponent counterattacked by great number of tanks and infantry. To the half of day Soviet formations of were compelled to depart on initial positions. 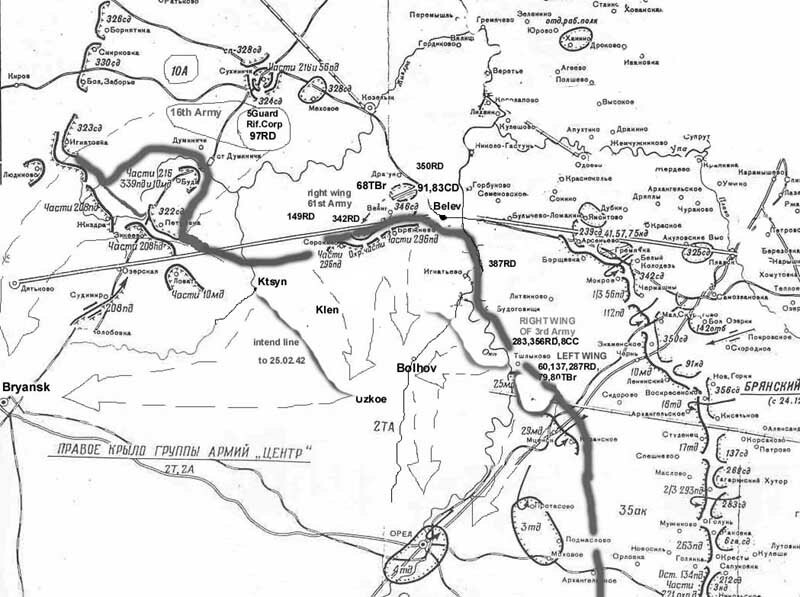 July 6-14, 1942 16th Army will carry out offensive operation in Zhizdra area. In tank forces of 61st Army, for example, before the beginning of realization in July, 1942 Bolkhov offensive operation was present 334 tanks of seven marks. From them only 67 (20 %) - T-34. When Soviet 10TC occupied defense northwest Suhinichi, conditions on a southern wing of the Russian/German front has sharply worsened. Defeated armies of Southwest and Southern Fronts, German armies order offensive to Caucasus and Stalingrad. In the beginning of August Germans have occupied Maikop, send to foothills of Caucasus, have made the way to external defensive contour at Stalingrad. July 9, Hitler ordered on realization on the Moscow direction new offensive operation under the code name has signed "Tornado" which beginning was planned on 7 -9 August. Marshal of Soviet Union I.H.Bagramjan recollected how this operation began:German command... August, 11. Has undertaken powerful offensive by a large forces on the Soviet left wing of the Western Front. German plan was reduced to deep break of defense of Soviet 16th and 61st Armies and development further success in Suhinichi direction and then move in Uhnov area and to put under threat all left wing of the Western Front. For realization of this German operation was involved about fifteen divisions, including five tank, having up to 500 machines. Were widely used also aircraft. August 11, was ordered to make march from area Suhinichi and concentrate to morning August, 12 on the northern bank Zhizdra river behind the left flank of 16th Army, in readiness for counterstroke in a southern direction, towards to the tank group of the opponent which broken in the centre of defense of Soviet 61st Army and has left to the Zhizdra river on site Vosty. Counterstroke of 10TC had for an object to not admit connection of German group join with the second group developing the impact to it towards in a strip left-flank Soviet 322RD of 16th Army. This order of the commander of 16Army (Bagramyan), received late at night, has not taken 10TC unawares. Immediately all units were lifted on fighting alarm and on beforehand developed routes have set out. Almost simultaneously it became known, that on rail-station for updating the echelon of new tanks (35 KV and 17 T-60) has arrived. These tanks went basically on strengthing183th and 178th Tank Brigade. Now 10TC were present 156 tanks (48 KV, 44 MKII and 64 T-60). Updating by tanks was made practically on a march - directly from rail platforms they have joined brigade columns. Tanks and motor vehicles, observing a blackout, went in full darkness on two roads broken by bombardments and dim recently past by storm rains. Are dear, running on woody district, were densely hammered by the armies moved in both directions. It created the big difficulties for brigades, is especial for 186TBr: all crews of the arrived tanks were completed with the mechanics - drivers who just have finished training with the experience of practical driving of only 2-3 hours. 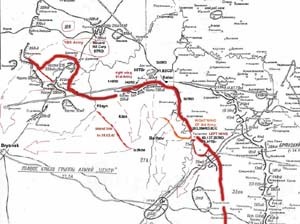 At 10:00 August, 12, 178th and 183rd TBr, having finished 70 kms a march, have begun to concentrate in the areas to the north Zhizdra river, and 11th Motorifle Brigade it was straight off forwarded through the river and, having brought down advanced parts of the enemy, has left on boundary Dudino, Volosovo where has passed to defense, covering expansion of the main forces of tank corps. To this time investigation has established, that German 9th,11th Panzer and 52nd Infantry Divisions have seized Staritsa and Debrymi and continue to come in a direction Bely Verh and Perestryazh. Not expecting the order on drawing counterstroke, the commander of Soviet Tank Corps has ordered 178th,183th Tank Brigades to be forwarded through Zhizdra river. Having overcome the river, 178TBr has concentrated in a grove. However tasks were quickly put brigades and at 12:30, 183 and 178TBr have started attack. Having developed on the move in fighting orders, they promptly counterattacked advanced German units and have rejected them on the south. By August 14, 183TBr has seized Pochinok, and 178TBr Bely Verh. In second half of day German aircrafts have strengthened continuous massed impacts on the 10TC and from a reserve tank and infantry divisions which attacked coming Soviet forces. August 15, 186TBr having lost 35 tanks, were compelled proceed to defense on boundary Pochinok, Perestryazh. September 3, 10TC has promoted on depth of 5-6 kms. Thus has seized the Polyana, Poloshkovo and Vorob'yevo. On it offensive 16th Army was finished. In second half of day September 3, 10TC, having transferred an occupied boundary 9TC, was removed in a reserve and has concentrated in Kozel's area. In total during fights under Suhinichi 10TC has destroyed about 5500 german soldier, 140 guns and mortars, kill up to 200 tanks and assault guns. Night on August, 13 1942, 1st Cavalry Corps has offensive on boundary Pochinok, Perestryazh where was compelled to proceed defense 10th Tank Corps. In the morning August 13, tankmen and cavalrymen have renewed counterstroke in a direction Bely Verh village: in the centre tank brigades, and on flanks - 1st&2nd Cavalry Divisions. Coming Soviet formations were met by fire of German tanks fixed in settlements and antitank guns. Soon Germans has thrown in fight the main forces (up to 120 tanks), including 11th Panzer Division. Forces of 10th Panzer Corps and 1st Guard Cavalry Corps were compelled to proceed to defense on boundary Zhilkovo, Bely Verh. With the approach of strong reserves in the morning August 14, German armies at support of massed impacts of aircraft have renewed offensive against 10th TC and 1GuardCC. Having failed to bring down frontal attack of a brigade of 10th TC, the opponent has brought down impact on next cavalry divisions, not had necessary quantity of antitank guns. Not having sustained a pressure of tanks, 1GCD has left Perestryazh and has departed in Volosovo, and 2GCD could not keep Dubna. Thereof flanks 10TC appeared open. Having broken resistance of cavalry, the opponent has directed to Zhizdra river, intending straight off to grasp ferries through it at Vosty and Dretovo. Here they were met by tank ambushes of 10 TC and had in loss, withdrawell on the south. By August 15, 1GCD held defense more to the left of 10 TC, retreated on a boundary Polyana, Dretovo. August 22, 1GCC, together with 10TC and 5Guard RC in structure of a shock grouping 16th Army, has gone over to the offensive against put in defense 16th Army in Zhizdra area German forces. Later Soviet impact has joined by 9TC. Coming formations from the beginning have collided persistent resistance of German 9th, 11th and 19th Panzer Divisions and reflecting their counterattacks, by September 3, has promoted on depth of 5-6 kms. On it offensive of Soviet 16th Army was finished. August 11, 1942, 322 Rifle Division which was settled down on the left flank of 16th Army on a boundary on the river Resseta by an extent of 17-18 kms, front to the west, appeared on a direction of the main German impact, aspiring to leave to the Zhizdra river and to incorporate with main German group which has broken in a strip of 61st Army. In midday August, 13, for rendering assistance of the 322th division covering approaches to the Zhizdra river to the west Vosty village, from structure 183rd Tank Brigade of 10 Tank Corps the group of 9 tanks was allocated. Having put forward in area Krasny Octybr' and having saddled the roads conducting to ferries through the river, the group has not admitted break of the opponent. It has destroyed German 2 tanks, 2 antitank guns and up to 25 enemy soldier. In the night August, 15, on a boundary Polyany, Dretovo more to the left of a site of defense of 322 division hasretreated 10TC. In second half of day August, 15, using the superiority over alive force and tanks, Germans have surrounded 322 division. To it the tank group of 183TBr from 7 staying tanks to the aid has again come. At the critical moment of fight it prompt counterattacked in flank of the opponent and has beaten out it from Gretny. Having grasped a ferry, Soviet group has enabled 322 division to leave for an arrangement of Soviet forces. August 17. Soviet High Command gave order to the Commander of West Front to organized retreat 61st Army from encirclement. На интернет-сайте www.casinoz.biz можно узнать все подробности про онлайн казино Фортуна Плей. . Гибкая кровля и другие материалы для строительства продаются в нашем магазине стройматериалов.